We’d love your help. 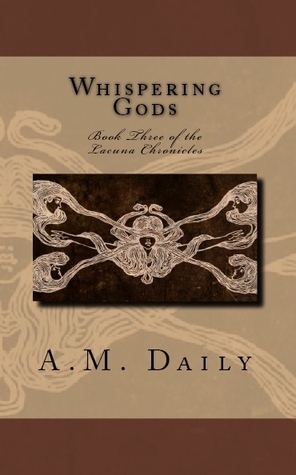 Let us know what’s wrong with this preview of Whispering Gods by A.M. Daily. On Vesta, Caden and his traveling compani Before the descent of the Ezri and the brutal reign of the Terah, the independent governments of Earth banded together to launch six colonial ships in an effort to safeguard the future of humanity. Five ships were successful in their mission to colonize and populate five Earth-like sister planets. One ship vanished without a trace. On Vesta, Caden and his traveling companions uncovered navigation coordinates which led to the missing sixth colony of Earth... where they were greeted with an ominous message, turn back. To ask other readers questions about Whispering Gods, please sign up. I stumbled by accident across the Lacuna Chronicles. It is situated in a science fiction/fantasy environment around different populations (humans, Eszri, Mechi and Terah) and different planets. The story evolves around 3 main characters: Mikas, Caden and Blue and their quest to find the lost planet Lacuna. I liked the plot a lot and the way the different conflicts were told. That's why the five stars. However, then I read that this was supposed to be the last book of a trilogy and I am tempted to I stumbled by accident across the Lacuna Chronicles. It is situated in a science fiction/fantasy environment around different populations (humans, Eszri, Mechi and Terah) and different planets. The story evolves around 3 main characters: Mikas, Caden and Blue and their quest to find the lost planet Lacuna. However, then I read that this was supposed to be the last book of a trilogy and I am tempted to take away some stars: Even though there was some kind of achievement in the end, still I ended with more questions than answers. Why did the Eszri leave their planet in the first place? Who are the Terah? Why are they destroying Earth? I immediately took up the fourth book, but no solution there. It is only about Atti, a very minor (boring) character in this book. So, I did not continue. And the fifth book will be about Blue, whose chapters I already skipped here as also kind of lengthy and un-inspiring. Amazing series. The Lacuna Chronicles is a tale of lovers destined to be together throughout space and the flow of time. Just read. I am so happy to have found this series! I feel like as a reader who enjoys both sci-fi and romance, but not necessarily sci-fi romance, this series filled a void by creating a universe with real romantic relationships, with the focus on an amazing sci-fi plot. I’ve loved this entire series. There’s so much going on and the possibilities seem endless. If you haven’t read this series there will be spoilers ahead so steer clear. Not that a few spoilers will ruin the series for you. The best part is the journey of these three friends in their quest for happiness and freedom from the oppression of the Terah. The only life they’ve ever really known is struggling to survive and living in constant fear. This series follows the trio across the galaxies. Their friendships are tested as they all go separate ways but they’ll always be connected. I think that’s the thing that makes this series so brilliant. There are many story lines and they’re all compelling. At the end of the last book the trio of Caden, Blue and Mikas all finally made it off Earth. Seemingly safe on the planet of Aurora Caden and Senka still feel the pull of Lacuna. They’ve found a brilliant navigator and pilot is Xiah. So they set out to follow their instincts and find the home of their people. Xiah and Mikas form more of a bond. They both crave adventure. Mikas is used to his conquest giving into him but Xiah isn’t your average guy. Their relationship takes a turn from turbulent to friends and then to lovers. I don’t feel like that’s a big spoiler as the tension has been building. Neither man wants to want the other. Neither man wants something more than sexual gratification initially. I’m really looking forward to where their relationship heads. It’s nice to see these two stubborn men find something in each other finally. Xiah is completely and utterly fascinating. He’s cold and hot. Brilliant but can be cruel. He keeps Mikas on his toes. Their sexual and emotional tension is off the charts in this book. Their portion of the book was my favorite part of Whispering Gods. Caden and Senka lead the guys into danger on their quest to find Lacuna. Their faith is tested. Their bond is strengthened. We’ve learned a lot about the Ezri as the series evolves but there’s so much more I want to know. In this installment we learn more than ever and it opens up so many possibilities for the series. I can’t wait to see what’s next. This part is a little harder not to spoil so I’ll just say prepare for some twists and turns. Blue who has been my favorite character of the series and Loki finally have the life they’ve always wanted. They’re crazy about each other. Totally in love. Free to be together. That should be enough but for Loki it’s not. When they thought they only had a limited time together that was enough. Now with Blue’s mortality lingering between them he’s sought out the help of a shady business man who may be able to prolong Blue’s life. Earth is finally destroyed at the hands of the Terah forcing refugees to flee to their planet. Mikas asks Blue to see if Caden’s sister is among them. An impossible task but true to Blue’s character he takes on the task for his friend. I’m not going to lie and pretend I didn’t do a little dance when I got my hands on this book…and maybe squealed a little. Lol I was all but burning with curiosity with the way the last book ended and was very nearly salivating at the thought that I was going to get to dive back into this amazing universe. I apologize for nothing. Starting right where the previous book left off, this latest story in the Lacuna Chronicles continues to follow Caden and his frien Review written for Love Bytes Reviews. Starting right where the previous book left off, this latest story in the Lacuna Chronicles continues to follow Caden and his friends as he searches for the lost Ezri homeworld. Interspersed with their travels into the unknown are chapters about Blue and Loki who, for some strange reason, I didn’t think I’d be seeing again after the last book. That was obviously incorrect and for that I am very glad as I am just as enthralled with these two men as I am with Caden and his quest. Like in the previous two installments, I was immediately drawn back into this universe with an ease that doesn’t always happen with other series I’ve read. The storylines are just so intricate and it doesn’t matter which characters I’m reading about, I’m continually enthralled by them all. One of the best things about them all is that every character the author introduces, and focuses on, is continually changing as the story progresses. Caden, for example, has really come into his own and the changes he’s undergone since I was first introduced to him are startling; he’s really found his purpose in life and its obvious he isn’t the naïve kid he was in the first book anymore. Mikas is finally starting to realize that he can’t keep freezing people out and that, maybe, he doesn’t want to anymore. Watching him with Xiah was one of my favorite things about this book as you get to see both men changing the way they operate as they continue to orbit around each other. I can’t even get into Blue right now; the amount of love I have for him is beyond words at this point. I find myself continuously amazed by this author and this series; this book was, like the previous two, amazing. The story itself kept me glued to my kindle, torn between wanting to savor what I was reading and reading faster because I just couldn’t wait to see what was going to happen next. There was an added emotional impact with this story, as well; this author has made me care about these characters and what happens to them and, while not the end of the series, this book does finish this story arc. By the time I’d gotten to the end I felt as though I was saying goodbye to a friend that I hoped to see again but didn’t know if I ever would; silly perhaps but I find myself so emotionally invested in these characters that I just don’t want to let them go. I really just can’t recommend this series enough; all three books have blown away my expectations and as they build on one another, you need to start at the beginning to understand and get the most out of them. If you’re a fan of sci-fi and haven’t read this series yet, I’m telling you that you need to. I loved this and can’t wait to see what’s next! A.M. Daily is a LGBT writer who lives in beautiful Arizona. She writes queer fiction within a variety of genres including (but not limited to); contemporary fiction, historical fiction, and science fiction. She is currently working on books six, seven, and eight of the Lacuna Chronicles, a gay sci-fi series.